Another Sunday night round up coming your way! But first…. I want to tell you a little story…. just to mix things up a little bit. 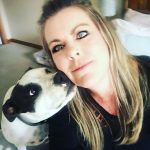 I thought you might be interested to get to know some of the people behind Love-A-Bull, there are a team of us, headed up by Love-A-Bull’s founder, Judy. I will do a proper introduction to Judy for you all, when I can get this crazy busy, dedicated woman alone for 5 minutes to do a proper interview, and the same for all the others on the Love-A-Bull team. So for now, I thought I’d start off by introducing you to me, Sharon. I joined the Love-A-Bull team about 7 months ago, taking care of the website, Instagram and Twitter accounts for Love-A-Bull. 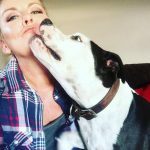 Like most people, when I was first introduced to the Pit Bull breed, about 15 or so years ago, I believed all the negative propaganda spread by the media about the breed and to be totally honest, I was terrified of my families first rescue Pit Bull, Rocky. But he won me over with his beautiful Pit Bull smile and his big heart. Three Pit Bull’s later and I’m a complete convert, Pit Bull’s are my spirit animal. 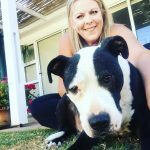 I found out about Love-A-Bull through my daughters school, they ran a charity drive last year, collecting food for Love-A-Bull and when I went and did my own research and landed up liking and following their Face Book page, I felt called to action by Sweety’s story. I saw her photos and knew I wanted to do more. 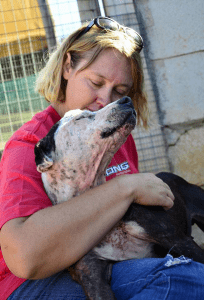 That’s when I started sponsoring dogs at Love-A-Bull, first it was Sweety and when she passed away, I transferred my sponsorship on to other dogs. But I am nothing if not tenacious and determined and I just continued to pester the hell out of Judy and Rochelle until eventually they agreed to bring me on board, using my knowledge as a blogger to help promote Love-A-Bull. 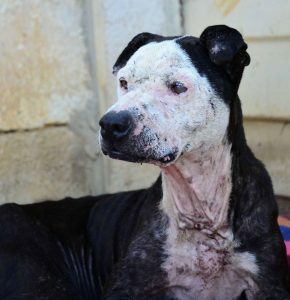 As you all know by now, Love-A-Bull is a registered NPO, we are solely reliant on the generosity of the public to keep our kennels open and to assist Judy in doing the incredible work she does in advocating, educating and promoting responsible Pit Bull ownership. There are so many ways you can get involved! You can adopt, donate or sponsor. 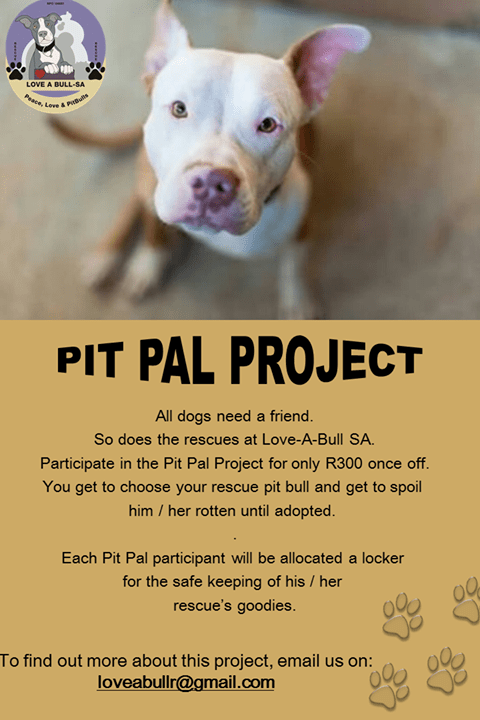 Or you could become a Pit Pal! Currently our kennels are full to capacity. Unfortunately, demand always seems to be higher than the supply. So once again, we appeal to you, our supporters to assist where possible. Currently, our food supply is running low so any donations towards food would be greatly appreciated. You can make a donation via EFT directly into our bank account. With summer just around the corner ( I know, I’m digging deep for a silver lining but soon it will be Spring) we are looking to ramp up our fund raiser efforts and we’re in need of our own gazebo. We have a company on board to do the printing on the gazebo for us (thank you Stacey) but if anyone can help us with our own gazebo, that would be amazing. Get your dog micro-chipped, this can be done at your vet for a small fee & the annual subscriptions are low. Get your dog an identity disk with your contact details visible. Keep your dog in doors or with you when you are at home. One of the most astounding facts I’ve become aware of since joining the Love-A-Bull team is just how vulnerable our breed it and not just to the unsavoury characters, but those who use the incorrect and forceful training methods. Join our Face Book page to find a list of trainers we endorse for our breed.